ICE Santa Monica: Grand Opening to Feature Venice - Yo! Venice! The ICE at Santa Monica skating rink, located at 1324 5th Street (Corner of 5th & Arizona), has returned for a 6th year! 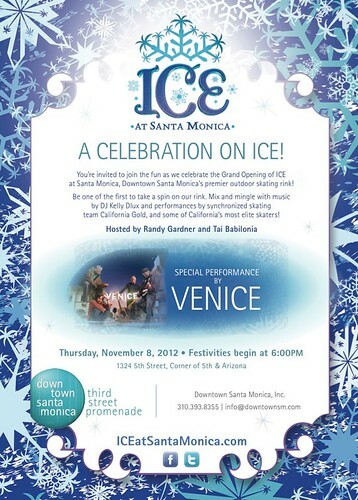 The grand opening celebration will be held tomorrow, November 8th, from 6-10pm and feature Randy Gardner and Tai Babilonia, performances by synchronized skating team California Gold, a night of free skating to music by DJ Kelly Dlux and a holiday concert by the band Venice. ICE at Santa Monica is now open daily through January 21, 2013. Admission and skate rental is $12. ICE Bites Café will provide snacks and a mini kids rink will be available for children ages 6 and under.